Do you find that the airflow coming from your vents is low? Are people constantly suffering from allergies and respiratory discomfort? Is overall air quality a concern for you and your family? It may be time to look at your air ducts as the cause. Call (937) 488-4758. CJS offers the most thorough Dayton air duct cleaning, repair, and installation solutions that can restore clean air to your home in no time! The ductwork in your home is the main component used to distribute air throughout the home. This is why it can have such a damaging effect when it’s dirty or in need of repairs. At CJS Heating & Air we provide customers in and around Dayton with the very best air duct solutions. From cleanings to repairs, our professionals will provide you with a timely and efficient air duct solution. See what some of our satisfied customers have to say here, and call us to find out how we can improve the air quality in your home with our air duct services. How can you tell if your air ducts need to be serviced? Poor Airflow – Because the air ducts are responsible for transferring air throughout your home, the easiest sign to determine that something is wrong, is when there is poor airflow in your home. This can be caused by either a leak, blockage, or mechanical damage existent in the air ducts. Bad Smelling Air – In some instances rodents can find their way into your air ducts and leave “deposits.” This can result in some serious smells every time the air conditioner is on. Not only can this be disgusting, but it can also pose serious health risks, especially for those with respiratory issues. High Energy Costs – Clogged or dirty ductwork can have a serious effect on the energy efficiency in your home. If the passageway for air is blocked, your air conditioner has to work harder just to regulate temperatures. This can translate into high energy costs to heat or cool your home. Fluctuating Temperatures – Another sign that your ductwork is in need of service is fluctuating temperatures. Is one room hot while another is cold? This can happen when air simply has a hard time reaching specific areas in the home because of poor ductwork. Are you noticing these signs in your home? It may be time to contact our professionals immediately. At CJS Heating & Air we provide our customers in and around Dayton with the very best air duct repair and cleaning services. We will start by inspecting the ductwork. If we see obstructions or damage, we will repair them immediately. Once we are finished, we will test the systems to ensure that the proper amount of air is flowing from your ductwork. What are the benefits of adding new ductwork? With our industry leading experience, we can install ductwork just about anywhere in your home. This is especially beneficial for home additions and renovations. 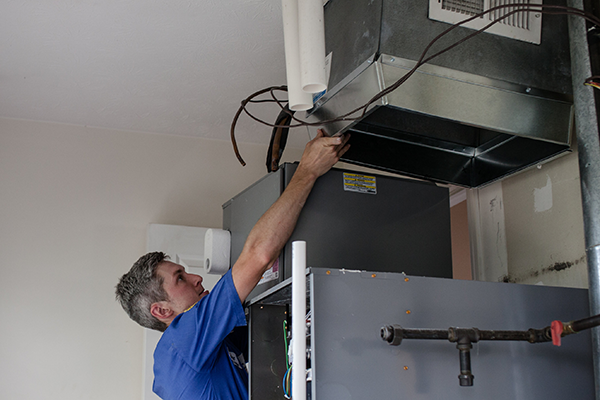 Our services are all about you, which will allow us to create a duct system that will provide you with the airflow that you need, where you need it most. When you need high quality air duct solutions from a highly skilled and trained company, look no further than CJS Heating & Air. Our services are all about you, ensuring that you are always 100% satisfied with the solutions we provide you with. We are also available for same day services, which helps you solve your issues quickly, before they become a challenge in your home. Also, we have the tools needed to provide a thorough service in your home. We will check every aspect of your ductwork to ensure that they’re ready to provide your home with fresh and clean air. Also, we guarantee our services, which helps in the event that you install new ductwork in your home. Get the highest quality Dayton ductwork services backed by our 100% satisfaction guarantee. Call (937) 488-4758 and let our professionals provide you with the best cleanings, repairs, and installation solutions today.